On March 27th, the U.S. Department of Justice announced that a federal grand jury had indicted a Madison Alabama police officer for using unreasonable force against Sureshbhai Patel, a 57-year-old Indian grandfather. Police had followed upon a 9/11 call that a suspicious-looking “skinny black guy” was walking around a residential neighborhood. Mr. Patel happened to live in that neighborhood with his son. After questioning Mr. Patel, it became clear that he had limited English ability and was from India. Still, Officer Eric Parker assaulted him – video available here. The assault left Mr. Patel partially paralyzed. Mr. Patel’s case generated a range of responses from within and outside the South Asian American community. Organizations such as Asha Kiran, a local Alabama group, and South Asian Americans Leading Together (SAALT) in DC, called upon the federal government and the Madison police department to take action and implement changes in policies and practices. The Madison police department fired Eric Parker, the officer. 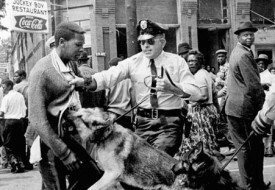 The Indian government expressed its outrage, which led to the governor of Alabama making a public apology for the officer’s use of excessive force. Community members signed petitions, wrote letters of support to Patel, and placed the assault in the larger context of police brutality in the United States. The news of the indictment of the former police officer certainly marks an important moment in this case. 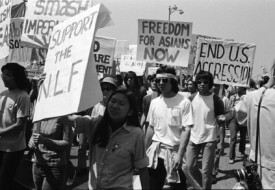 It also presents an opportunity for South Asians to reflect and position ourselves in the national struggle for justice against state violence and police brutality, one which disproportionately affects communities of color, immigrants, and LGBTQ individuals. *A Step Forward: The indictment of former Officer Eric Parker is an important step forward – not only for Mr. Patel’s family but for the pursuit of justice in all cases involving police brutality. Parker has been indicted under the “color of law” statute (commonly known as Section 242), which holds public officials with lawful authority (like police officers, prison guards and judges) to a higher standard of performance. It doesn’t require that racial animus need to be shown, rather that the public official acting under lawful authority deprived someone of their rights or privileges. Still, this indictment can ring hollow in the larger context of police accountability cases. When I heard about it, I immediately thought back to the pain and outrage so many of us felt when we heard that Darren Wilson had not been indicted in the killing of Michael Brown or that the federal government could not press charges against George Zimmerman for the killing of Trayvon Martin. While Ferguson, Missouri and Madison, Alabama are not the same places, and the cases may be different technically and legally, the underlying sense of injustice lingers: when can we rely on the justice system to work for all of us – for Sureshbhai Patel and also for Michael Brown, Eric Garner, Antonio Zambrano-Montes, Fong Lee, and Trayvon Martin? But reforming laws is only one step. As we saw from the DOJ’s report on the Ferguson police department, the conditions that often lead to the discriminatory treatment of communities of color have deep roots that cannot be addressed merely through legal remedies. Systemic and structural changes must be put into place at police departments as well. The interim report of the President’s Taskforce on 21st Century Policing identifies some of these changes based on recommendations and testimony from community advocates. They include integrating anti-racism training and diversity hiring by law enforcement agencies as well as policies outlining the use of force, the prohibition of profiling, and preventing the use of a quota system to issue tickets and summonses. The tremendous task of incorporating these recommendations lies ahead of us. *A Wake-Up Call: The Madison, Alabama case is an opportunity for South Asians to become involved with the larger epidemic of state violence and police brutality that has destroyed families around the nation. Certainly, we should not wait for it to “happen to us” before we get engaged on any issues of fairness and justice. But for South Asians who have not yet become involved with addressing the root causes of state violence against communities of color, the case of Mr. Patel might be a turning point and a wake-up call. We can learn more and we must do more. *Being An Ally: In the wake of what happened to Mr. Patel, different perspectives emerged within the South Asian American community about what this case meant in terms of South Asian solidarity with Black communities. Should the incident be characterized solely as an example of the insidious and pervasive nature of anti-Black racism, given the tip that the police acted on from a community member who said that he was worried about “a skinny black guy” walking around in the neighborhood? Or should Patel’s immigration status and limited English proficiency be identified as unique factors that played a role in the response by the police officers? Should the incident be a launching pad to address the internal racist attitudes that some South Asians hold towards Black people? The answer is yes, yes and yes. It is important to do all. As I wrote in an earlier piece with Subhash Kateel, South Asians can and must ally with the Black Lives Matter movement because it is moral and right to do so. At the same time, we must also recognize that there are reasons in addition to the legal, systemic and cultural frameworks of anti-blackness – such as immigration status, language ability, and national origin – that lead to discrimination against our own communities. South Asians lose no political or moral ground in holding both of these positions. Our desire to build solidarity and allyship with Black communities (which must be fostered at every turn) cannot be fulfilled at the expense of disregarding and discounting the ways in which racism and discriminatory treatment occur to non-Black community members. In the case of Mr. Patel, framing his actual lived experience of state violence only in the context of anti-Black racism discounts and marginalizes them. Mr. Patel’s encounter with law enforcement was sparked and catalyzed by anti-Black racism, but his nationality and his limited English ability had much to do with the assault as well. Mr. Patel’s experiences are in line with other experiences of state violence and discrimination that South Asians have faced throughout our history in the United States, from the Bellingham race riots in the early 20th century to the post 9/11 climate of surveillance and profiling. In standing against white supremacy and in solidarity with Black communities, South Asians must not erase our own experiences confronting racism in the United States. This is the time for us to be both allies and active, respectful participants in the conversations and actions to end police brutality.